“It's been many years since I dipped my ears in that raging ocean....” confesses Alex Ross in a recent email about the music of Kaikhosru Sorabji, and what an eloquent description “raging ocean” is of that composer's unique soundworld. Kaikhosru Sorabji, seen above, was born on August 14th, 1892 in Chingford, Essex. But it is unlikely, even in an age obsessed with composer anniversaries, that the 120th anniversary of his birth this week will receive much attention. Sorabji’s output included six piano concertos, three organ symphonies and six symphonies for solo piano. But he remains a marginal figure – his music has never been performed at the Proms – who attracts just a small cult following. That following, incidentally, includes a young Alex Ross who broadcast the four hour Opus Clavicembalisticum on Harvard’s student radio station WHRB a few months after Sorabji died in October 1988. Today Sorabji is remembered mainly for his prolixity. This reaches a peak in one work for solo piano that lasts more than eight hours, and two others that break the six hour barrier. He uses six and seven replete staves in some compositions, ten of his piano works fill more than two hundred pages, and his Jami Symphony – which is not his longest orchestral work – sprawls over 830 pages and almost 100 staves. Needless to say such music presents enormous challenges to the performer, and Sorabji famously discouraged unauthorized performances to prevent what he called “obscene travesties”. Kenneth Derus - dedicatee of Sorabji’s Opus secretum – writes that parts of Opus Clavicembalisticum make “the very different hurdles of Boulez and Stockhausen seem very low indeed” and that “Xenakis and Ferneyhough write nearly as many notes, and deploy them far less gratefully, but neither requires that these notes be consistently and exhaustively voiced to have any kind of sensible meaning at all”. All of which is very true, but does make Sorabji’s music sound rather intimidating and inaccessible. Which it is not; the roots of Sorabjji’s music lie not in the avantgardistes – he distanced himself from many contemporary trends - but in Busoni and the late-Romantics. An identifiable influence on the Opus Clavicembalisticum is Busoni’s Fantasia contrappuntistica, while Scriabin, Debussy and Szymanowski have been cited as other inspirations, and, perversely, Sorabji’s circle included the Anglo-Welsh miniaturist composer Philip Warlock. An intensely private man, Sorabji kept his private life and his homosexuality from the public eye. The child of a Parsi father from Bombay and an English mother, he was given the names Leon Dudley Sorabji at birth. Parsis are followers of the prophet Zarathustra, and Sorabji underwent a late baptism and a change of forename to mark his embrace of the ancient Zoroastrian religion. His acceptance of a mystical faith that was both a progenitor of the three great monotheistic religions and a precursor of Christian heretics including the Gnosticisms and Cathars is reflected in the metaphysical element in his compositions. These include a Tāntrik Symphony (No 1) for piano with seven movements named after the bodily centres of Tantric and Shaktic yoga, a Piano Sonata (No 5 Opus archimagicum) inspired by the Tarot, and the Benedizione di San Francesco d'Assisi, a setting for voice and organ of a Catholic benediction. Sorabji's Parsi ancestry and interest in mysticism was also reflected in his enthusiasm for the Persian Sufi poets including Jalaluddin Rūmī - this predated by some years Rūmī's popularity in the West. Today immortal masterpieces are the currency of classical music. But, just as there is much overlooked music that is neither easy nor difficult, so there is much neglected music that is neither a minor-piece (equivalent to Michelin's one star rating) nor a masterpiece (three stars), but which merits a two star rating - meaning “excellent, worth a detour”. 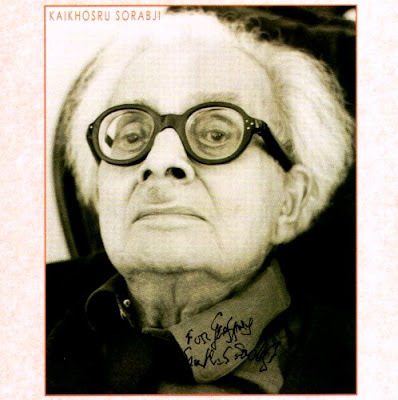 Kaikhosru Sorabji’s music is certainly worth a detour, and hopefully this short appreciation will encourage readers to explore his raging ocean of sound as an alternative to our quotidian diet of immortal masterpieces. * There is no easy introduction to Sorabji’s music, but Geoffrey Douglas Madge’s recording for BIS of the Opus Clavicembalisticum is a good starting point. Remastered from a 1983 concert performance in Chicago it is available as 5 CD set selling for the price of three (£38.69), or a bargain (£14.98) MP3 download, for which you get 3 hours 56 minutes of music. The header image is taken from the CD sleeve and the dedication reads “For Geofrey - Kaikhosru Sorabji”. ** Kyle Gann has written about the four and a half hour long Jami Symphony and linked to a Midi realisation; elsewhere Kyle has ten hours of Sorabji’s music available as downloads plus videos. *** More information and a catalogue of works at the Sorabji Archive and at the Sorabji Resource Site, and a useful overview of recordings of Sorabji's music here. Also on Facebook and Twitter. My thanks go to Alex Ross for generously finding time for Sorabji while immersed in Wagner. Any copyrighted material on these pages is included as "fair use", for the purpose of study, review or critical analysis only, and will be removed at the request of copyright owner(s). Report broken links, missing images and errors to - overgrownpath at hotmail dot co dot uk V1.1 14/09 with amendements to Tantrik Symphony and book title. Great read! I've been into Sorabji since I discovered him in my early teens, and I still believe the best introduction is his first piano sonata, which may be an early work, but for my money is still one of the easiest to follow and enjoy. Regarding Opus Clav, we can only hope to get a full recording of Jonathan Powell playing this work. He posted a live recording of the first part on his website, and it far surpasses the recordings done by Madge and Ogdon. Both are far below what Sorabji undoubtedly would have wanted, especially Madge's recordings. "In view of the fact that the birth-date and birth-place of this composer as given above (1892, Essex) have been contested, and various dates given, it may be added here that a close enquiry has been made and official confirmation obtained. (The composer. it appears, resents 'stupid and impertinent inquiries from lexicographical persons' and makes it a practice 'deliberately to mislead them as to dates and places'. Letter to the author of this book - 22 Feb. 1952"
I note that a thread on the Sorabji archive is devoted to the 120th anniversary and bemoans the lack of media coverage. One contributor mentions my article, which is a genuine attempt to raise Sorabji's profile, and which readership statistics show has reached a very wide international audience - considerably wider than the Sorabji archive. "The errors are not hard to notice for those who know something about Sorabji, so I won't point them out." With attitudes like that among the "experts" is it surprising there is virtually no coverage of the anniversary? As one who for many years has had a tough-and-go relationship with Sorabji's music, I found your piece very informative. I would be interested to know the errors. Perhaps Mr. Eisenbruk can be persuaded to elaborate upon them for the good of all. What expert could resist that? John, thanks for that. Jakub Eisenbruk has now listed the suggested amendments on the Sorabji Archive as per the link above. Two of these have been incorporated into my text and a version change note added. Attitudes on the Sorabji Archive are so toxic that I have been tempted to simply delete the post. But it remains, in case what another Sorabji forum member describes as the "bogus any selfesteeming blogger wishes to blurt out" contributes in some way to understanding this strange and fascinating composer. Wow - the prickliness lives on! Not bad at all, although there's always more to be said. Thank you. As I explained before this post was a genuine attempt to raise Sorabji's profile. Over the last eight years many other posts have attempted to do the same for lesser known musicians. But none have met with such an equivocal response from the "experts". The conclusion I draw from this path is that the problem is not the lack of acceptance of Sorabji's music, but the misdirected advocacy of it by the self-appointed keepers of his flame.